An international showcase and cuisine will provide a sampling of cultural heritage from around the world during Hope College’s “IMAGES: A Reflection of Cultures” on Saturday, Nov. 16. “Images” will begin with a dinner from 4:45 p.m. to 6:15 p.m. in the Phelps Hall dining room that will feature cuisine from Algeria, England, Ethiopia, France, Greece, India, Italy, Japan, Mexico, Russia, Vietnam and more. For those not on the college’s meal plan, admission to the dinner will be $5 per person, payable at the door. 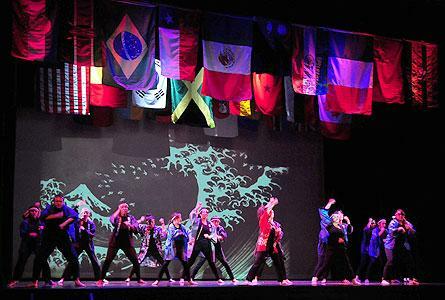 The international showcase, to which admission is free, will begin at 7 p.m. at the Knickerbocker Theatre. The showcase will feature an array of skits, dance, song and other clips of culture through languages and fashions. More than 60 students will participate from several countries. “IMAGES: A Reflection of Cultures” is sponsored by the Hope College Office of International Education. The Knickerbocker Theatre is located in downtown Holland at 86 E. Eighth St. Phelps Hall is located at 154 E. 10th St., on 10th Street at Columbia Avenue.